Gaslighting victims around the world blinked on Tuesday when The Washington Post revealed that a fake Time magazine cover with the president’s face is hanging up at Trump golf courses around the world. Donald Trump’s administration would not explain this glaring example of fake news. The facts lead to even weirder questions. While the Trump cover has some design inconsistencies (like a thinner red border and an absent inner white line), it also features several of the same headlines as the Winslet cover. However, they’re arranged in a way that’s not consistent with Time’s cover design. “I can confirm that this is not a real TIME cover,” Time Inc. representative Kerri Chyka told the Post. Things get weirder from there. As developer Jordan Merrick pointed out on Twitter, the barcode on the fake cover is assigned to a piece of karaoke DJ software that was on the market in 2009. And while there are other bits of evidence that prove the Trump Time cover is a fake, it’s difficult to figure out who made it, why they made it, and how Trump’s staff decided to hang the falsehood inside the billionaire’s golf clubs. I’ve done my best to do some quick internet sleuthing, and the results suggest that this is all some weird internet satire project gone awry. A Google Image search of the fake Trump cover brings up a couple other fake Time covers with similar designs. 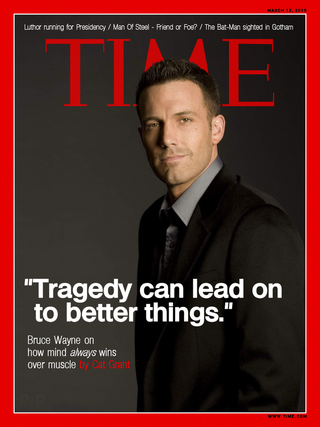 One points to an image on Deviant Art depicting Bruce Wayne (the Ben Affleck edition) on a fake cover of Time in some weird posture opposing the presidential run of Lex Luthor. The other points to a fake cover of Time showing Kane, a character from the video game Command & Conquer, as Person of the Year. The same image shows up in a forum discussing Hillary Clinton’s picking Tim Kaine as her vice president from July 2016. While both of the parodies appear to have been created well after March 1, 2009, the associations are undeniably hilarious. Meanwhile, the line on the Trump cover, “The ‘Apprentice’ Is a Television Smash,” doesn’t appear in any article predating the Post’s story, but a similar phrase, “‘The Apprentice’ is a smash,” actually did show up in a Washington Times article from 2004. Not that it necessarily matters, but it is a clue.